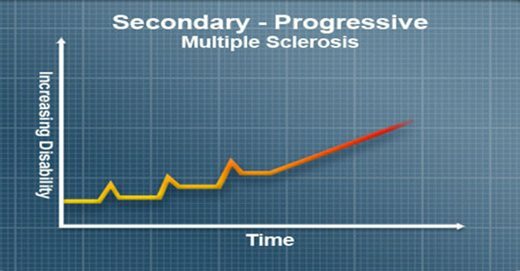 Although the transition to secondary progressive multiple sclerosis (SPMS) is known to be a period of uncertainty for clinicians, who may find progressive disease challenging to objectively identify, little research has explored the experiences of patients and carers specifically during this transition period. Our objective was to explore what patients and their carers understand about their disease stage and describe their experiences and perspectives on the transition to SPMS. Semistructured qualitative interviews and subsequent validation focus groups were analysed using inductive thematic analysis. 20 patients with MS and 13 carers were interviewed. Eight patients and two carers participated in focus groups. Four main themes around disease progression were identified. ‘Realisation’ describes how patients came to understand they had SPMS while ‘reaction’ describes their response to this realisation. The ‘realities’ of living with SPMS, including dealing with the healthcare system during this period, were described along with ‘future challenges’ envisaged by patients and carers. Awareness that the transition to SPMS has occurred, and subsequent emotional reactions and coping strategies, varied widely between patients and their carers. The process of diagnosing the transition was often not transparent and some individuals wanted information to help them understand what the transition to SPMS meant for them.